I hope everyone is having a great Spring Break. I’m still getting caught up on phone calls and emails, but I’ve made sure to get out and enjoy the great weather with my boys. 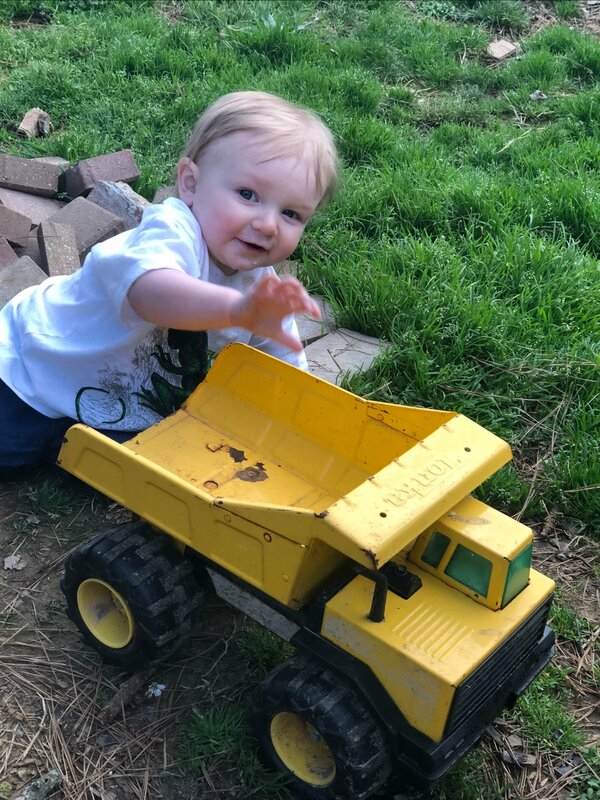 Remember all those Tonka trucks I got for Little Caleb years ago at an estate sale? Joshua is now playing with them when he gets a chance. 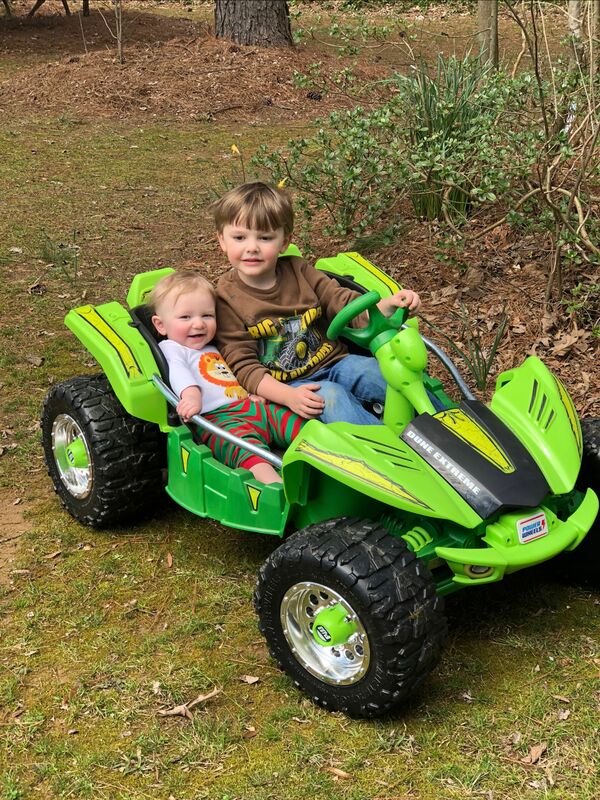 He also loves riding around in Little Caleb’s battery-powered ATV thing in the photo. Joshua turned 9 months old last week and he should start walking any day. I’ve been saying that since he was 7 months old, but then he discovered how fast he can get around crawling and I think he took a break from falling on his face multiple times a day trying to walk. Now he will pull himself up on the coffee table and go around and around. If he finds a toy on the coffee table he will grab it with both hands and examine the toy for a while without holding onto anything. Once he gets the confidence to step forward he’ll probably never stop walking. I still laugh at how Little Caleb took his first steps. We were cleaning at our previous home getting it ready to put up for sale and he picked up a scrub brush in one hand and a broom in the other and took off. I had my phone nearby and got almost the whole thing on video. I can’t wait to see how Joshua takes his first steps. I went to the new Hometown Kountry Marketplace in Maumelle with my mom and the boys and we found all kinds of goodies. 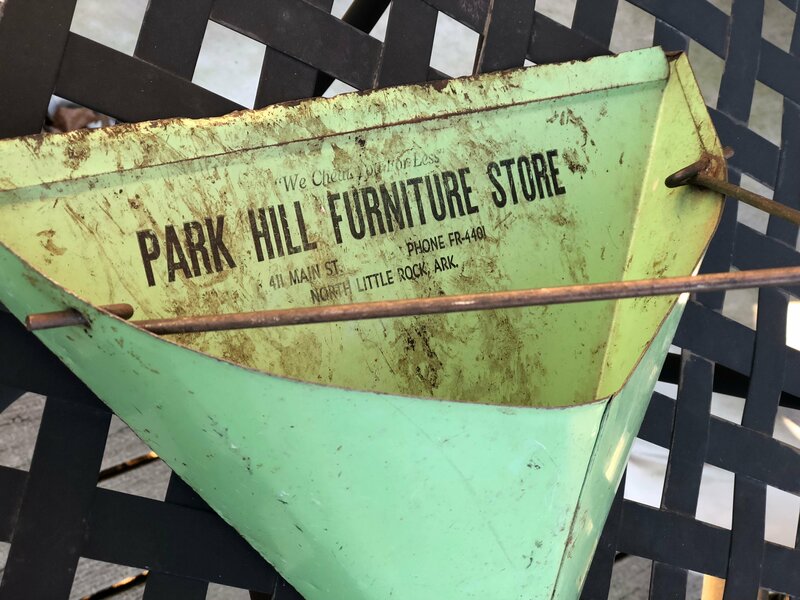 My favorite find is this metal dustpan for the Park Hill Furniture Store. I love local advertising items like this. 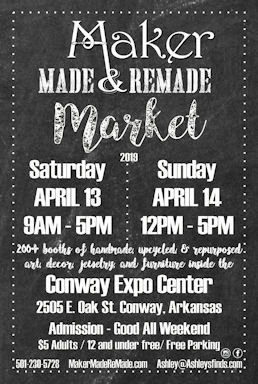 Hometown Kountry will have their grand opening April 6, but they are already open with some great booths. Cool Contemporary. We open with our cocktail hour sale from 3-6pm Friday. Sorry, no cocktails, just the hour. This beautiful home near the Botanical Gardens in north Fayetteville is packed with good stuff. From Pottery Barn to antiques, you will find something you’ll love at this sale. Lots of contemporary. Sofas, sofas, sofas—a red sectional, vintage Duncan Phyfe-style sofa, brown leather sofa, beige corduroy sofa and love seat, chairs, occasional tables, fabulous marble top bar, fancy bar stools, rugs, white wicker wardrobe, iron day bed, lots and lots and lots of home décor, gas fireplace and mantle, leopard print club chairs, wonderful kitchen items, Nespresso coffeemaker, Denon stereo components, Samsung washer and dryer, twig lamps, dining table, lots of chests- vintage and contemporary, tall round top bar table and chairs, all kinds of lamps, picture frames, mirrors, decorative art, great men’s and women’s clothing, Banana Republic, Gap, Coldwater Creek, Nike, Razorback gear, shoes and purses, Beanie babies and children’s furnishings, books, linen, CDs DVDs. On Saturday, March 23, we will be selling the following instruments and stage gear which belonged to the legendary Bob Hayes. It will be a ONE DAY ONLY sale at the same location as last week’s house sale. Each item will be priced and available for immediate purchase. We will also be accepting written offers of any amount. We do not have specific plans for reductions in price. It is possible that John will lower the tag price of various pieces as he sees fit during the afternoon… but will be taking any written offers into consideration when deciding those discounts. If you have any questions, please contact John at 501-607-4747 – text messages are preferred so that he can keep track of who contacts him about which pieces more effectively. Please help spread the word to all his friends and fans! The following information reflects the order of the photos of the guitars and amplifiers in the photo gallery. ALL of the Ovation guitars are in very good/excellent condition. ALL have their original hard shell, molded cases. 6. 1965 Rickenbacker electric 12 string. Serial # EH 474 Original hard shell case, silver color with blue interior. Excellent/Mint condition. 9. Hyundai six string guitar. Made in Korea. Model # HW-POB. Black chipboard case. Good condition. 10. Gibson Les Paul Standard. Serial # 509143. 1974/1975? Made in USA impressed on back of headstock. Black/Grey OSP hard case. Also has a hard case that is probably the original case, has broken handle. In my opinion, replaced…knobs, bridge, pick guard, selector switch, and tuners. 11. National “Lap steel”, “Hawaiian” guitar. “New Yorker” model. Serial # V 30108 Serial number dates it to 1947. Original hard shell Lifton case. 12. 1964 Fender Telecaster. Serial # L 47778. Original hard shell black Fender case, red interior. Finish is replaced from original. Bigsby tremolo may be original…? May be an addition to guitar. Replaced pick guard. 13. Gibson J 45 Serial # U 2604 14. Dates to 1957. Lifton case, rough condition. Condition of guitar is obvious… very large amount of play wear, especially to sound hole and bridge area. Bridge is replaced, tuners are replaced. Guitar has back of headstock crack. This crack is small and not reaching to the front of the guitar. There doesn’t appear to be any cracks in the body of guitar. 14. The Gibson… tenor banjo, circa 1920. 4 string banjo with metal resonator. Serial #11567-34. Good condition, no case. 15. Vega “Little Wonder” mando/banjo, guitar/banjo…circa 1920’s no case. 16. Oscar Schmidt/Sears 15 chord Autoharp. Circa 1966 Original hard case. Includes original paperwork from purchase. 1. Fender “silverface” Twin Reverb. Chassis number is 31146. Good condition. 2. Fender “Blackface” Twin Reverb-Amp. Chart code ID is OC. Chassis coded is A 00749. Amp is on casters. With original Victoria cover. 4. Fender amplifier “road case” on casters. 5. Gibson “Plus 50” amp head. Serial # 03069. Probably 1966. 6. Fender “Blackface” Deluxe Reverb-Amp. Chart code is QH. Chassis number is A19200. Great condition. 7. Fender “Blackface” Twin Reverb. This amp just went to the shop and got all new capacitors. Chassis number is A07657. Speakers are replaced with Altec Lansing,417-8C. The original front cover/grill was replaced at some point with one of Bob Hayes’s screen-printed t-shirts. Klipsch Industrial Series Speakers – hardshell cabinets with built in handles and reinforced corners and edges – perfect for stage touring or home. This includes a pair of La Scalas, and several pairs of Heresys. Large collection of vintage pedals, microphones, cables, speaker stands, mic stands, music stands, Peavy powered sound board, rack mounted effects, and other sound gear. Cystal, silver plate serving pieces, English hobnail punch bowl/tray/cups, lamps, oriental runner, holiday items, Spool twin bed, contemporary dresser, painted dresser and night stand, collectables, kitchen and household items, Men’s and young ladies designer clothing, weight bench, sporting goods, trail bike, garage items, washer, dryer, Like new stainless frig, patio furniture, grill, fine and costume jewelry and more! Join us this weekend for a Sidewalk Sale, featuring home decor, fashion and more! That’s right, browse all the items you love… inside AND out! Get ready for a great on-site estate auction. 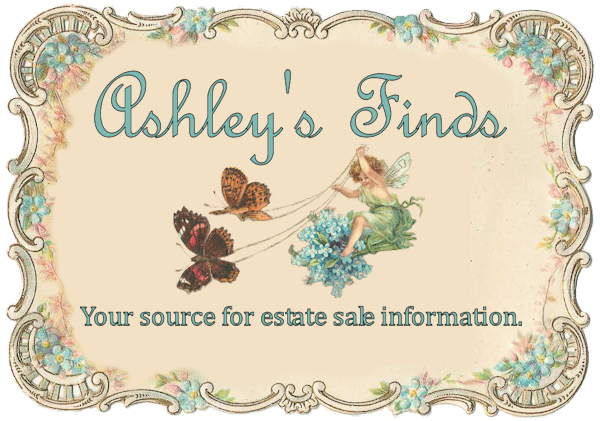 One estate, and owner is downsizing and closing decorating business. Owner has rented a 6000 sq. ft.store front space so that it could all be brought together and be sold at auction! 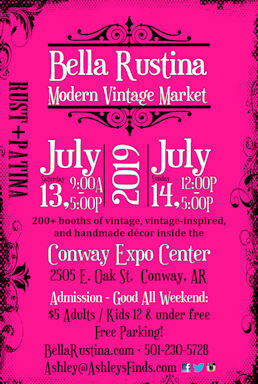 Lots of great antique and decorator furniture, mirrors, sofas, chairs, tables, metal patio furniture, decorative metal work, iron plant stands, linens, cabinets, loads of nice rugs, outdoor garden items, chandeliers, framed artwork, nice Christmas decorations and other great holiday decor, gold and silver jewelry, costume jewelry, Razorback memorabilia, nice high end pillows, several small tables, Shopsmith in great condition, and much more to be listed in near future. This weeks is already filling up for Monday night.we are selling the final part of the antique store out of Lonoke.plus our reg consignments.3- iron beds,4-wood beds,dining table and 6 chairs,roll top desk,tools,jewlery,front load washer,antique curio cabinet,book cases,oil lamps,more to come still unpacking. Consisting of but not limited to: Mid Century dresser, chifferobe, oak S roll top desk, Maytag washer, G E dryer, Kenmore side by side refrigerator, nice butcher block, large ornate bird bath, 5 piece iron and glass patio set, coffee and end tables, Mid Century bed and chest, nice large beveled mirror, Duncan Phyfe 3 piece bedroom set (bed, dresser, and night stand), nice Mid Century sofa, Duncan Phyfe lyre table, Jenny Lind bed, nice area rug, recliners, oak cabinet, yard tools, churn and crock, pitcher pump, swing, Husqvarna 4 wheel drive lawn mower with grass bag, nice extension ladder, Char-Broil Quick Set gas Grill, fishing gear and rods, green Aladin lamp, wood duck decoys, wood butter mold, Coleman copper fire pit, first day stamp covers, and more. Doors open 9:00 A.M. day of sale for inspection. All announcements day of sale take precedence over printed material. No buyer premium.